UFO SIGHTINGS DAILY: GREEN UFO ORB, Angels Among Us? Animal totem? WOLF SPIRIT? SPOTTED IN WOODS ENGLAND 2016, UFO Sighting News. GREEN UFO ORB, Angels Among Us? Animal totem? WOLF SPIRIT? SPOTTED IN WOODS ENGLAND 2016, UFO Sighting News. 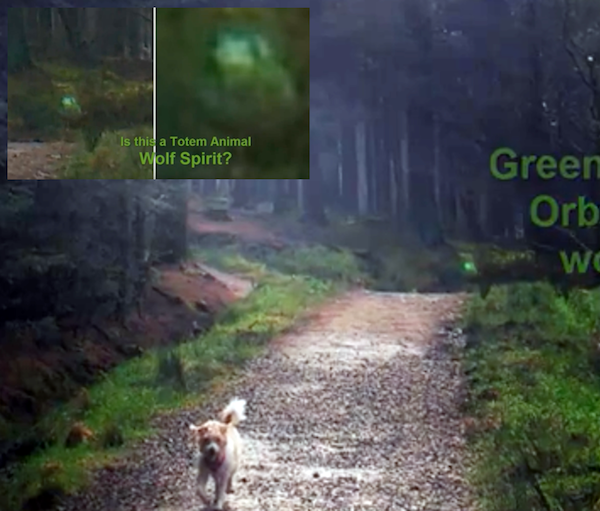 Here is an interesting photo of a green alien behind the dog on the trail. I say alien, because it has been seen before, running along someones house a few years back. I was in personal contact with them back then, and she said it was a small running creature that disappeared...sinking into the ground. I saw her photos and they look similar to this.